Penshurst Church is at the centre of the village and can be approached through Leicester Square which is attractively lined by cottages and stone buildings, one of which is the Old Guild Hall one of only two still standing in England. Exit the M25 at junction 5 on the A21 signposted to Sevenoaks, Hastings. Travel southwards for 4 miles to the north Tonbridge exit, following a brown tourist signpost to Penshurst Place. Follow these signs through the village of Leigh and down the long hill into Penshurst with penshurst Place below you on the left – with the church beside it. Park near the junction in the middle of the village by the Leicester Arms. The entrance to the church is 30m beyond the pub on the left hand side of the road. Leave the A21 at Tonbridge, driving through the edge of the town, then up the A26 toward Southborough and Tunbridge Wells. One mile up the hill, before Southborough, turn sharp right to Bidborough and Penshurst. Drive straight through Bidborough and you will enter Penshurst down a hill from the east, with a clear view of the church ahead of you – and Penshurst Place behind. Leave the A264 between Langton green (east) and Ashurst (west) on a road marked to Fordcombe and Penshurst. Drive through Fordcombe, across two bridges and you will arrive in the middle of Penshurst. 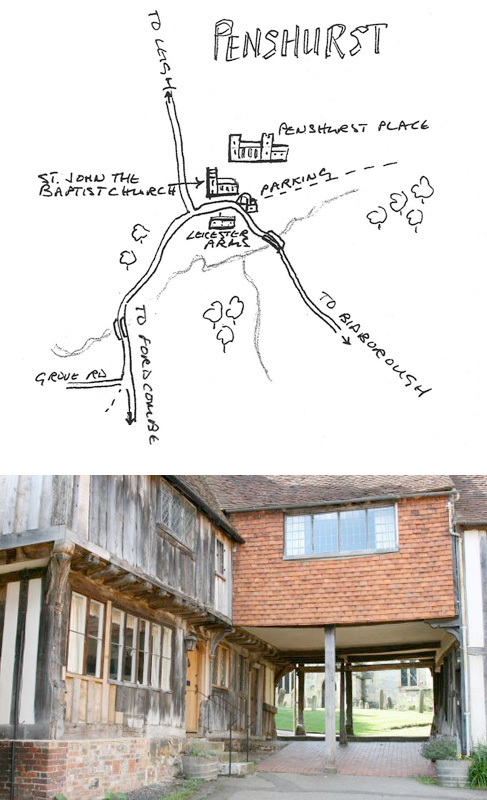 The church is on the left, c30 m after the Leicester Arms pub on the right – and before the gatehouse to Penshurst Place. This website and other interpretation material have been made possible by a grant, which is gratefully acknowledged, from the Heritage Lottery Fund. Penshurst Church can be spied through the arches of the Old Guild Hall as you round the bend heading North along the (B2176) into Penshurst.